There are definitely concerns for the Miami Dolphins on the offensive line. Jake Long, a former first overall pick and perennial Pro Bowler, is now in St. Louis. The guard position opposite Richie Incognito is also a big area of worry for 2013. But the two more important pieces to Miami's offensive front will rest in the middle and on the far left side of the line. Second-year man Jonathan Martin will be the starter at left tackle for Miami and will be tasked with replacing Long. 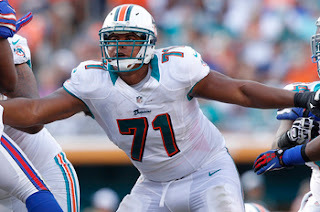 Martin started all 16 games for Miami last season beginning the year at right tackle before transitioning to the left side after Long suffered a season-ending injury. A former All-American by a number of publications at Stanford, Martin was taken by the Dolphins in the second round of the 2012 NFL Draft. Martin struggled at times last season, but has put on weight and will arrive at camp around 310 pounds. He has excellent feet, but the added weight should benefit him and the Dolphins not only in pass protection, but in the ground game as well. What makes Martin most important is that he will be tasked with protecting second-year quarterback Ryan Tannehill's blindside. Tannehill was sacked 35 times a season ago, which was tied for eighth most in the NFL. Tannehill also had nine fumbles a year ago with the majority of them coming on sacks. Protecting Tannehill will be Martin's top concern and the Dolphins should feel pretty good about him on the left side. He wasn't an All-American at Stanford for nothing and was an intricate part of one of the most successful eras in the history of Stanford football. The simple fact that he played his college ball at Stanford also says something about his intellect. At center will be third-year man and former first round pick, Mike Pouncey. Brother of Pittsburgh Steelers' center Maurkice Pouncey, Mike Pouncey made a good case for the Pro Bowl a season ago. With Long now in St. Louis, Pouncey may very well be the leader of this offensive line. 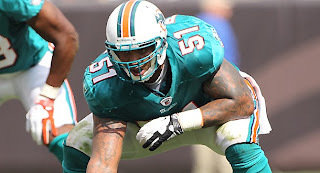 In two seasons with the Dolphins, Pouncey has played in and started all 32 games. With a 305-pound frame, Pouncey is a very mobile offensive lineman and a very good athlete. Although he struggled with it in college at Florida, he has been a consistent snapper as well and has shown little weakness anywhere. With there being plenty of concern at the right guard position, Pouncey will have to excel in the middle, particularly in short yardage situations. Since he's been with the Dolphins, Miami has been a much better running team. In 2010, the year prior to drafting Pouncey, Miami was 30th in the league in yards-per-carry. In his rookie season of 2011, the Dolphins improved to 15th before finishing 17th last season. The Miami Dolphins look to have a much improved offense all around this season, but it will all begin with the offensive line. If Martin can make significant improvements as most around the Dolphins' organization believes he will, Miami won't miss Jake Long all that much as 2012 was Long's worst season since being taken first overall in 2008. But with Long gone, the offensive line has a new cornerstone in center Mike Pouncey. Pouncey has proven himself to be a Pro Bowl caliber center and since drafting him, the Dolphins have been much improved in the run game which looks to be the Dolphins' biggest concern in 2013.